Device that incapacitates a person by inducing unconsciousness. 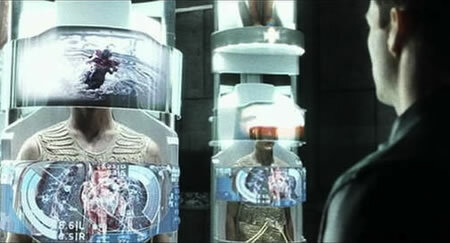 In the film, the halo (which is also referred to euphemistically as a 'hat') induces unconsciousness both in the short term (when a 'precriminal' is caught) as well as in the long term - incarceration. As the halo is fitted onto his head, Howard's body arches in a convulsive shock, his eyes rolling white into his head as he finally goes limp." Although not used in a similar manner (i.e., by law enforcement), you might compare this device to the napcap from Larry Niven's 2000 novel Saturn's Race, the sleep set from Niven's 1970 novel Ringworld as well as the sleep-inducing helmet from Arthur C. Clarke's 1964 story Sunjammer.